There are lots of ace things about blogging, for example, an excuse to eat cake for breakfast, a reason to buy swanky cameras you don’t reallllllly need. (Me? Never.) Going to some amazing places and meeting super talented, inspiring and downright lovely other bloggers. Lots of people have become friends through this blog, like my dear pal Em’ who is my real life blog wife. We’ve bonded through blogging and a love of making ridiculous videos. A few weeks ago, we tripped off to London for the day to do as Mum bloggers do and gossip and drink gin. Whilst discussing the meaning of life, Geordie Shore and all of the other important matters of the day with Katie of Hurrah for Gin and Amy of 2Boys1Mum, the idea for these brownies was born. Katie recently started selling seriously brilliant, cry-with-laughter cards, at Gin Bunny Prints so the chit chat included bunnies, gin and brownies. What more could you want from a conversation? Freeze the 6 bunnies to go on top so they don’t melt. Make sure you don’t over bake the brownies. Wait until they are cold to slice (if you can manage it). I cut them so each person got a whole bunny. This makes them whoppers. Do not feel you have to follow my greedy person bad influence. They will last well for 5 days in an airtight tin. 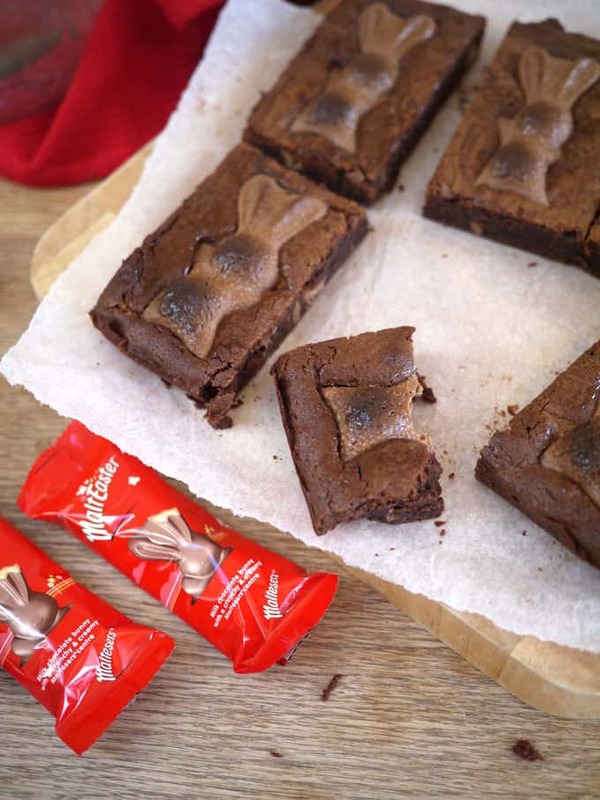 A great Easter treat for anyone who loves a chocolate brownie. Put half of the batter into the base of the tin and spread out. 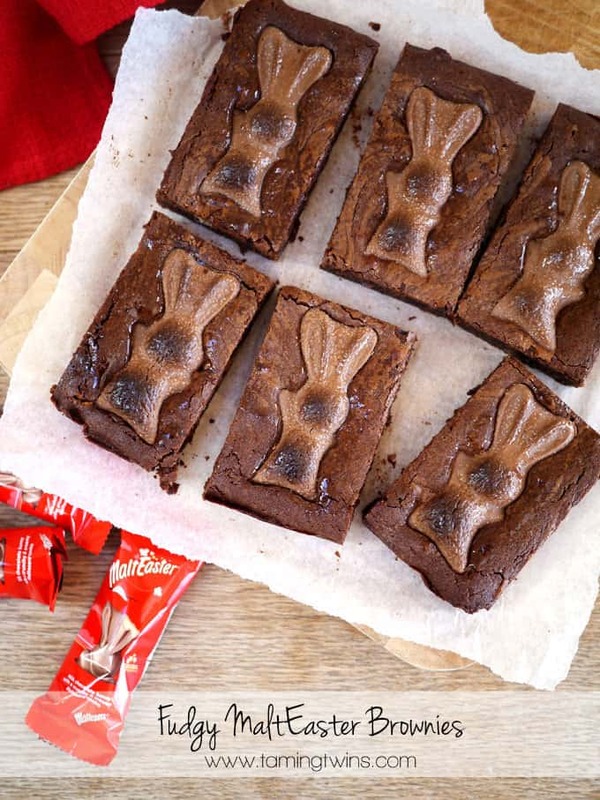 Chop 4 of your MaltEaster Bunnies into chunks and sprinkle evenly over the brownie batter. 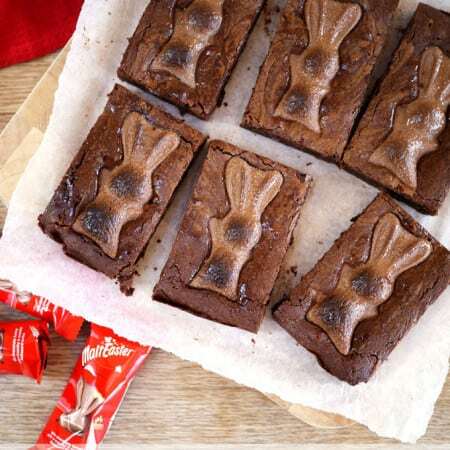 Spread the rest of the batter on top to cover the chunks of MaltEaster bunnies and smooth out with a spatula. Sit your frozen, unwrapped (obvs!) 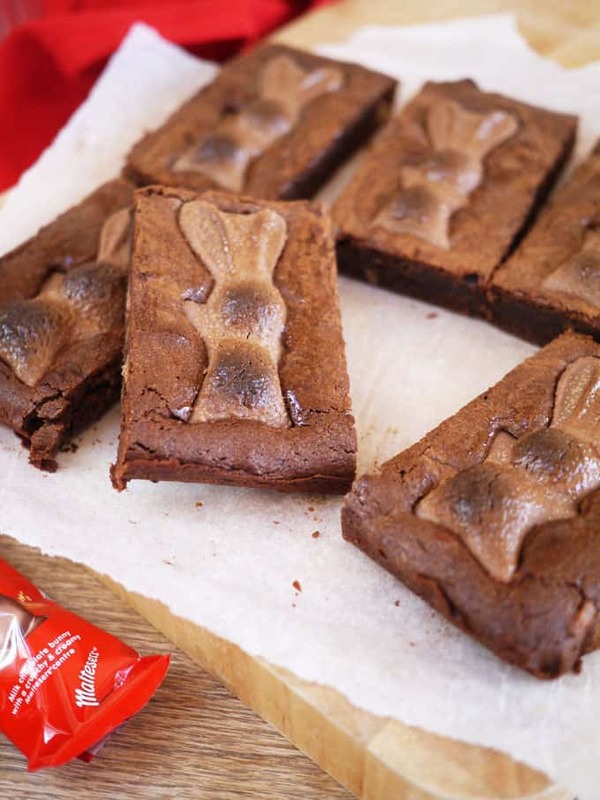 bunnies evenly on the surface of the brownies. What are you baking, making or eating for Easter? Oh. My. Days. I want them sooo much! So going to email you new cake related fantasies I have to see you make them come true! 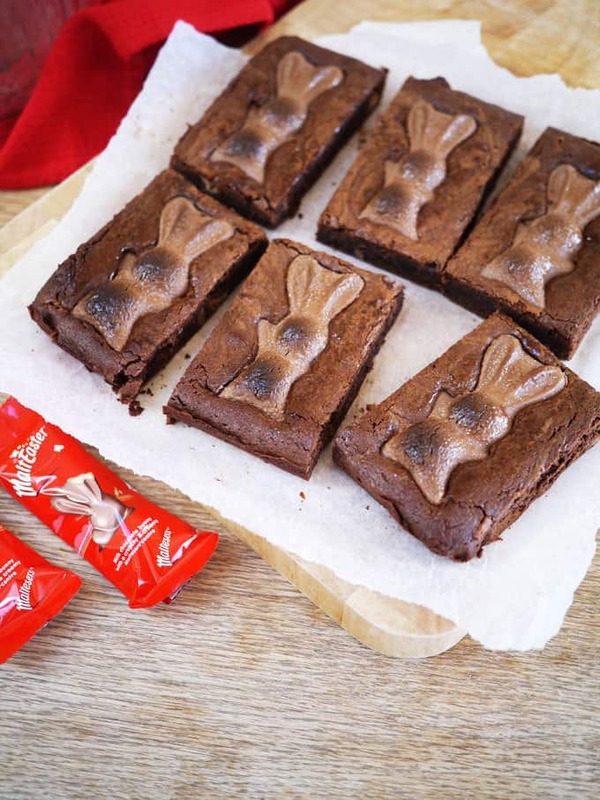 I have a household of all ages coming for Easter, and these naughty but so nice looking ‘have to eat brownies’ look the Bee’s Knee’s or (are the kids in bed?)…….. Sarah, I’d apologize for the size of those brownies too! You see, I like to cut them really small, then “lose count” of how many teeny tiny brownies I’ve eaten! 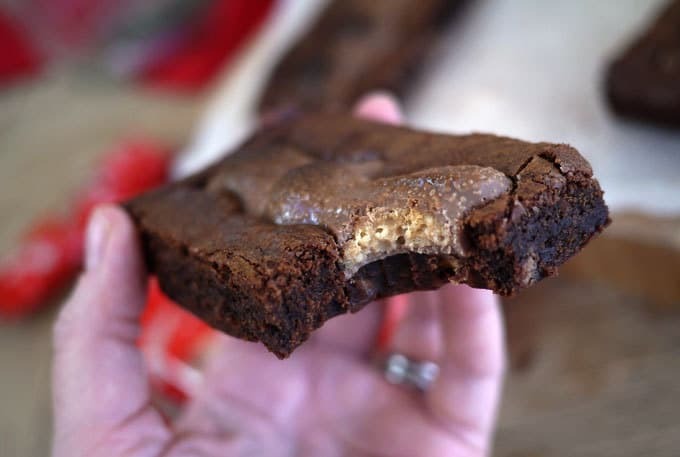 😀 Love the flavor of malt, but I’ve never thought of adding it to my brownies. Sounds great! Wow – amazing! There is nothing better than Malteaser Bunnies, oh wait yes there is these! Just made these with malteaser Reindeers for work xmas buffet tomorrow….trying not to eat one! They smell fabulous!